Domimyeon is a casserole made of fried sea bream fillets, vegetables and potato starch noodles in boiling broth. This dish is served and eaten while it is simmering. Domimyeon is unique in taste, luxurious and easy to eat since it uses boneless fish fillets. 1. Remove the scales, fins and internal organs of the sea-bream and rinse. Slice fillet from both sides of the fish and cut it into 4 cm-wide and 5 cm-long pieces. Sprinkle salt and ground white pepper, let it sit for 10 minutes, then pat dry. 2. Clean blood off the beef for broth. Clean blood off top round, and shred it at intervals of 0.3 cm-wide, then season with seasoning sauce 2. 3. Clean blood of the minced beef. Wrap the tofu with dry cotton cloths, squeeze water out and mash. Season the mixture of minced beef and tofu with seasoning sauce 3, shape dumplings into 1.5 cm-diameter. 4. Soak the mushrooms in water for 1 hour, remove the stems of brown oak mushrooms and dry, cut it into 2 cm-wide and 4-5 cm-long. Wash the stone mushrooms, chop it finely and mix it with egg whites. Trim the jelly ear mushrooms and separate it sheet by sheet. 5. Trim and wash the crown daisy. Halve the red pepper lengthwise and cut it into 2 cm-wide and 4-5 cm-long. Soak the potato starch noodles in water for 1 hour. 6. Remove tops of the pine nuts and wipe them with dry cotton cloths. Soak the walnuts in warm water and skin. Stir-fry the gingko and skin. 7. Panfry egg for garnish. Panfry the stone mushrooms and watercress with coatings of wheat flour liquid and beaten egg, cut them into same size of brown oak mushrooms. 8. Put water and beef in the pot and heat it up for 7 minutes on high heat. When it boils, reduce the heat to medium and simmer for 30 minutes. Strain the broth through cotton cloths (800 g). Take out the beef, slice it into 2 cm-wide, 1.5 cm-long and 0.3 cm-thick pieces, season it with 40 g of seasoning sauce ①. 9. Coat the beef dumplings with wheat flour and beaten egg, panfry for about 3 minutes on medium heat. 10. Coat the slices of sea-bream with wheat flour and beaten egg. Preheat the frying pan and oil, panfry it on medium heat for 2 minutes and for another 2 minutes after turn over (185 g). 11. Place the boiled and sliced beef, seasoned beef and potato starch noodles in the simmering pot, and put the sea-bream’s head and bones on it. 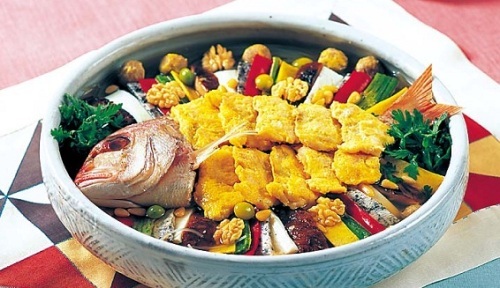 Then place the fried sea-bream, egg garnish, vegetables and nuts around the pot. Add broth and boil it for 4 minutes on high heat. When it boils, season with diluted clear soy sauce and salt. Bring it to a boil and finally put the crown daisy on top.